Keeping Your Eyes In Tip Top Shape? Eyes are, without a doubt, two of the most important parts of the body. This isn’t because they’re some kind of window into the soul, nor is it because of their beauty for those lucky enough to own a pretty pair. No, it’s simply because they give you the ability to see the world for what it is – for most people, anyway. Sadly, this sense degrades over time. It’s not exactly ideal, but it’s certainly not something that can’t be completely prevented. While many people will be affected by eye health problems over the years, or are indeed born with them – necessitating glasses, contact lenses or even laser eye surgery to permanently fix the problem – there are certain things you can do to preserve your sight for longer. Here’s a quick guide to how you can best protect your vision! Starting at the age of 40, it’s important to get annual eye exams to avoid picking up on real problems too late, such as glaucoma or retinal damage. Even if you’ve been healthy all your life and have suffered no vision problems, it’s still a possibility. On top of this, diseases like diabetes can also lead to blindness; checking out your eyes could effectively control this problem. Ultraviolet (UV) rays from the sun have long been proved to be just as damaging to the eyes as they are to the skin. The best way to directly combat the sun is through the use of sunglasses with UV filters, particularly those that wrap around the eyes a little. Whether you have sunglasses or not, a wide-brimmed hat will also offer extra protection. The eyelid is known to be a common spot for a melanoma to develop, so this strategy can also reduce the possibility of skin cancer in that location. A diet rich in fruits and vegetables could help your eyes stay healthy. 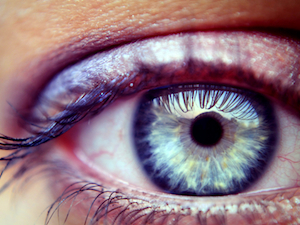 After all, it’s been posited that antioxidants such as lutein and zeaxanthin could lower the risk of eye issues. These are found in yellow and orange-pigmented offerings like squash, carrots and citrus fruits, as well as dark green leafy vegetables. Vitamins A (beta-carotene), C and E, alongside zinc, promote eye health. Take a multivitamin tablet that provides all of these, as well as any others that can help your body fight off infections. As one of the main contributors to almost any medical problem, smoking can lead to eye diseases because of reduced blood flow to the eyes. The eyes also absorb toxic substances from cigarette smoke. I try to eat a good diet to keep my eyes healthy.